A water well is a system of delivering water to a private home in an area where there is no integrated water system. Most towns and cities have public water works that have rigorous testing standards and deliver water to a large number of homes. Private water wells offer a water supply to single households, predominantly in rural areas where there is no public water system. Only those water well contractors licensed through the Illinois Department of Public Health are allowed to construct water wells. A listing of local water well contractors can be requested from the Environmental Health office. Do you have questions about getting your water well tested? ﻿See how the Crawford County Health Department is involved in private water supplies here! IDPH labs can test for coliform and nitrates. These are indicators, which means their presence may indicate the presence of other contaminants in your water. IDPH recommends that new wells and wells that have been repaired be tested to determine if the water supply is safe. More information regarding sampling for coliform and nitrate can be found on the IDPH's website. For more questions about water testing, contact the CCHD Environmental Health office. A free water test through IDPH is included with the construction of a new well. Once your well is completed, the pump has been installed, and the system has been chlorinated and allowed to sit for approximately 30 days, contact the Environmental Health office to set up a time for a water sample to be collected. It is recommended that the chlorine be allowed to dissapate for 30 days before sampling so residual chlorine in the water does not affect the results of the water test. Once the results from the test have been received (usually within 1 week of collecting sample), Environmental Health staff will interpret the results and provide the well owner with any recommendations if the test indicates an unsafe sample. If your well is not new and you would like it tested, a homeowner can collect a water sample and send it in themselves using a test kit provided by the health department. Please contact the Environmental Health office if you would like a sampling kit to test your water. Samples from these homeowner sampled kits are sent to the Illinois Department of Agriculture lab for testing. Contaminated water can cause illness, referred to as waterborne illnesses. Numerous pathogens can be involved in waterborne illness outbreaks. Examples of bacterial pathogens include Shigella, E. coli, and Salmonella. Parasitic pathogens include Giardia and Cryptosporidia. Norovirus can also be involved in waterborne illness. More information about these and other pathogens can be found on CCHD's foodborne illness page. Some wells may also have a high nitrate content. Sources could include agricultural runoffs, industrial waste water, private sewage disposal systems, and animal feedlots. High levels of nitrates in drinking water can be dangerous to infants because they can cause a condition known as methemologlobinemi a, more commonly known as "blue baby" syndrome. This name comes from the bluish color the baby's skin turns if it is affected. Prompt medical attention should be sought if this condition is observed. Boiling the water will not decrease the nitrate concentration; instead, the concentration will increase with boiling. An alternative water source should be used for infant formulas if you water is high in nitrates. What are different types of wells? Types of wells include drilled wells, bored wells, driven wells, and monitoring wells. The most common wells that are constructed in Crawford County for private home use are drilled wells and bored wells. Driven wells are usually constructed in areas with very sandy or gravelly soils. The drive point is driven into the ground with equipment or can be done by hand. Monitoring wells are constructed to determine groundwater quality or quantity. Abandoned wells are required by Illinois law to be sealed within 30 days of being abandoned by a licensed well water driller or property owner/tenant. Refer to the Illinois Water Well Construction Code for the proper procedures and methods for sealing an abandoned water well. For certified local health departments acting as Agents, the certified local health department shall collect a closed loop well system construction permit fee of $100 for the first 10 closed loop well boreholes drilled and $10 for each additional borehole drilled made payable to the Illinois Department of Public Health. All such fees shall be submitted along with a copy of the permit application, on Department forms, to the Department within 10 days of receipt to the eligible for compensation. Like the water well permit program, the certified local health department will receive 75% of permit fees collected, quarterly along with water well compensation as part of the IDPH Groundwater Protection Grant. 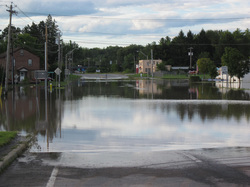 Our community ofter suffers very severe flooding that can devestate many homes. Please considered all aspects of your safety when returning to your home after a flood event. Personal hygeine, safe drinking water, food protection, power outages, mold, sewage disposal, and much more should be taken into consideration during flooding. The following pdf file can help homeowners gain more information about all the dangers of flooding and how different situations should be handled. Also, visit our page on mold for more information. If a private well is contaminated with flood water, it should be disinfected and then tested for microorganisms that are hazardous the your health before you begin using the system again. Please read through the folowing documents about disinfecting your well before using it again. After a well has been properly disinfected, it should be tested. Please contact CCHD if your well needs tested due to being contaminated during the recent flooding. If you have more questions regarding any of these matters, please do not hesitate to call the health department.